A ticker is a symbol, a unique combination of letters and numbers that represent a particular stockStockWhat is a stock? An individual who owns stock in a company is called a shareholder and is eligible to claim part of the company’s residual assets and earnings (should the company ever be dissolved). The terms "stock", "shares", and "equity" are used interchangeably. or security listed on an exchange. The symbol is used to refer to a specific stock, particularly during trading. Trades are executed based on a company’s ticker symbol, which is recorded in the exchange’s trading systemTrading Mechanisms - TradingTrading mechanisms refer to the different methods by which assets are traded. The two main types of trading mechanisms are quote driven and order driven trading mechanisms. The system will find the stock easily when the ticker symbol is entered. Shares of the same company can be traded on several exchanges, but they will have different stock ticker symbols for each different exchange the stock is traded on. 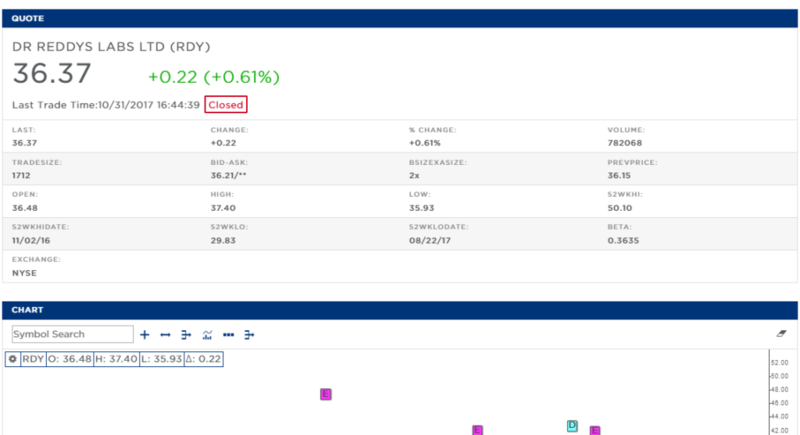 The two images above and below show us the difference between two symbols for the same stock that is trading on two different exchanges. 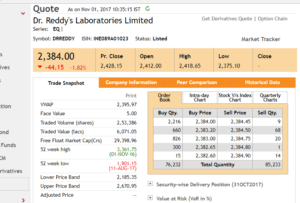 For the stocks of Indian pharmaceutical firm, Dr. Reddy’s Laboratories, the ticker symbol is DRREDDY on the Indian stock exchange, NSE, and RDY on the US stock exchange, NYSEDow Jones Industrial Average (DJIA)The Dow Jones Industrial Average (DJIA), also commonly referred to as "the Dow Jones” or simply "the Dow", is one of the most popular and widely-recognized stock market indices. Ticker symbols are used on stock exchanges because they are easy abbreviations that are useful to investors and analysts to help them identify stocks and obtain all relevant information such as stock split, dividend data, earnings reports, etc. There are some companies that trade with two different symbols on the same stock market because they offer two classes of shares, one with voting rights and another without voting rights. An example is Alphabet, formerly known as Google, which trade under the symbols GOOGL and GOOG, representing the company’s class A shares and class C shares, respectively. The symbols also help in identifying the type of shares traded on different stock exchanges. They are presented in different patterns in different indices, which makes them easy to find on trading sites and stock exchange websites. The shares of Berkshire Hathaway is traded with two stock symbols, representing its two class of shares that are traded on the NYSE: class A and class B with ticker symbols BRK.A and BRK.B, respectively. Class A shares provide shareholders with more voting rights compared to class B shares. This type of classification is necessary to avoid confusion. To clearly classify the types of stocks, it is necessary to use different symbols.